Note: If you want to mix and match supplies, you can use marker for the small details like the penguins and scarves, then add white oil pastel and watercolors for the background. Just remember to use watercolor paper, and do the marker parts first so that paint doesn’t clog your markers. 1. 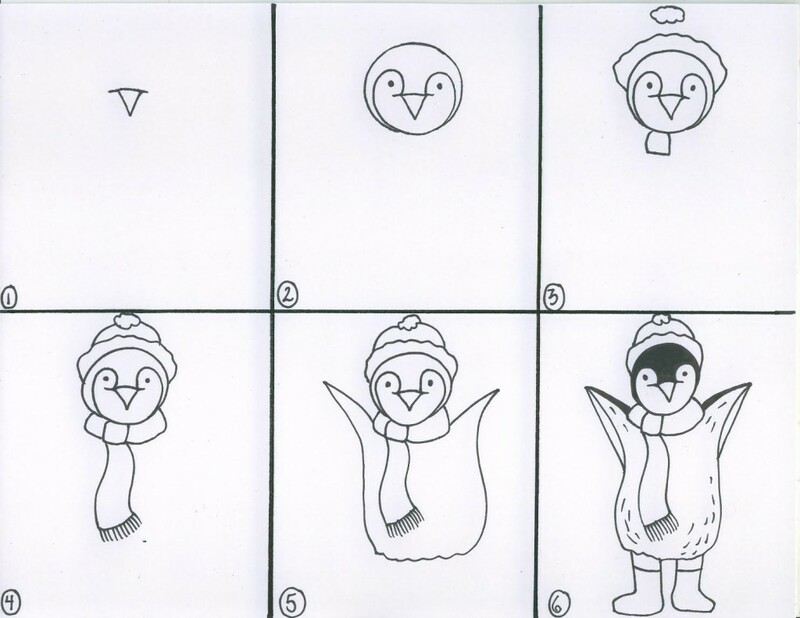 Choose which penguin drawing is right for you. One has simpler shapes that will be easier and more satisfying for little ones to follow. Encourage kids who are older or more confident with their lines to choose whichever one they like best. 2. 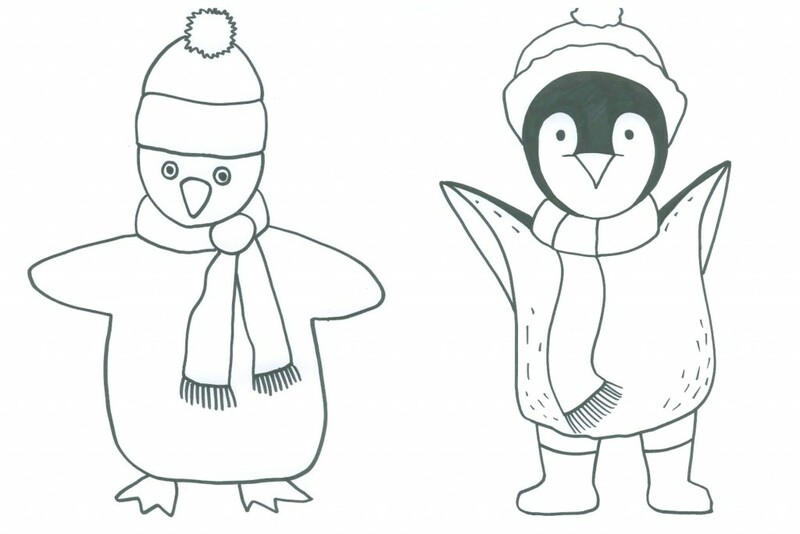 Tell your kids a little bit about penguins so they know about what they’re drawing. Penguins walk, slide and swim instead of flying, even though they are birds. They live in the Antarctic (the South Pole), but lots of other places too – the Galapagos Penguin actually lives near the Equator, where the weather’s pretty warm. There are lots of different kinds of penguins; some are three and a half feet tall, while others are only a little over a foot tall. 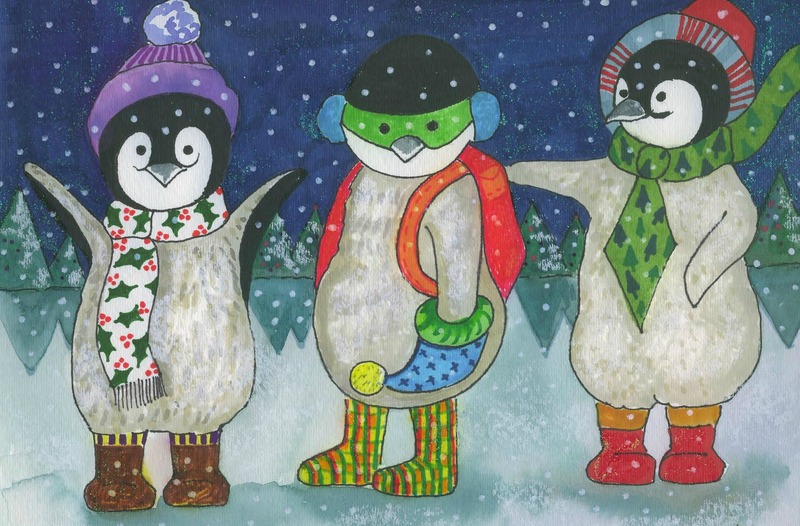 They don’t really wear scarves and hats, of course, but that’s the great part about art – you can add fun things from your own imagination, whenever you want! 3. 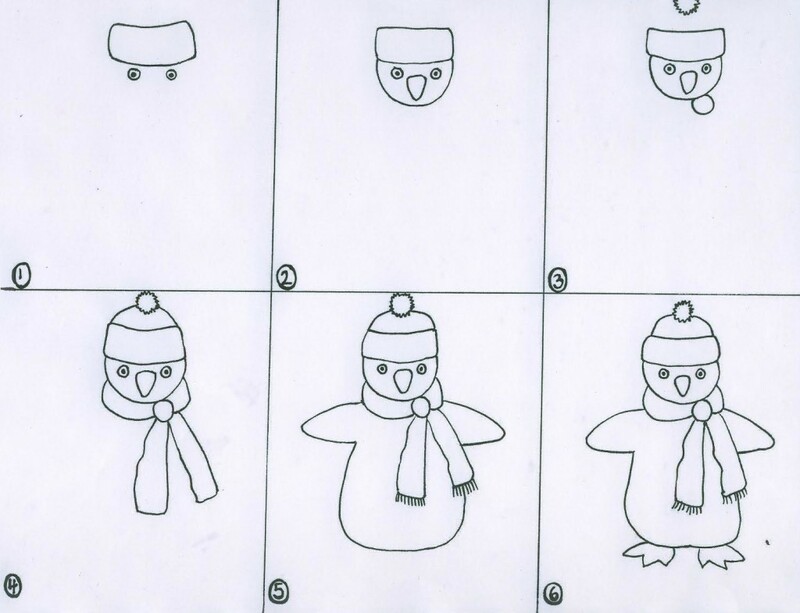 Follow the steps shown for drawing your penguin, starting by using details like the face, head, and hat as building blocks before moving to the rest of the body. 4. Once you’ve got the outline of your penguin drawn, use your sharpie to fill in the parts you want to be black – remember, a lot of penguins are mostly white or gray in the front and black on their back, with just a few black parts reaching to their wings and face. 5. Use the marker or paint to fill in the rest of your drawing, adding your own details. 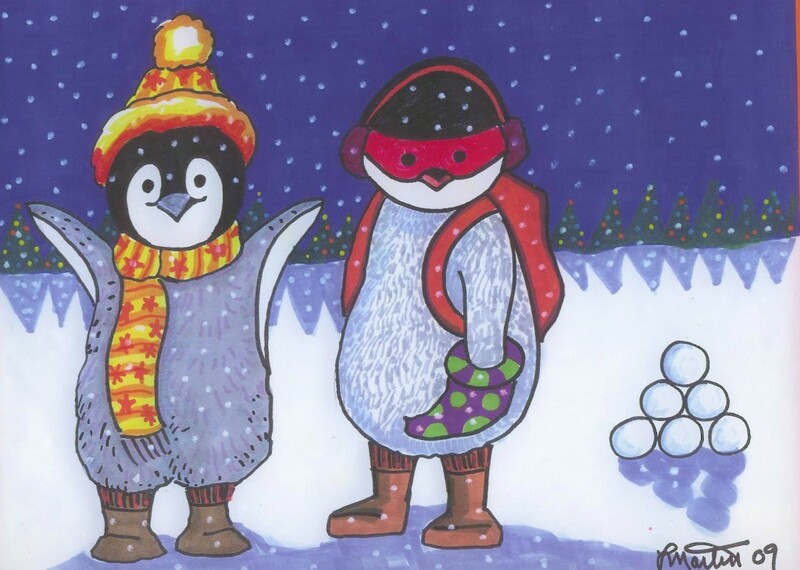 Invent your own designs and colors to decorate the scarf and hat (and boots, if your penguin has those). Get creative! 6. Now it’s time for your snowy background. If you’re using watercolor paints, you can use white oil pastel first to make white snowflakes and light areas of snow. Then paint right over it – your white parts will still be there! 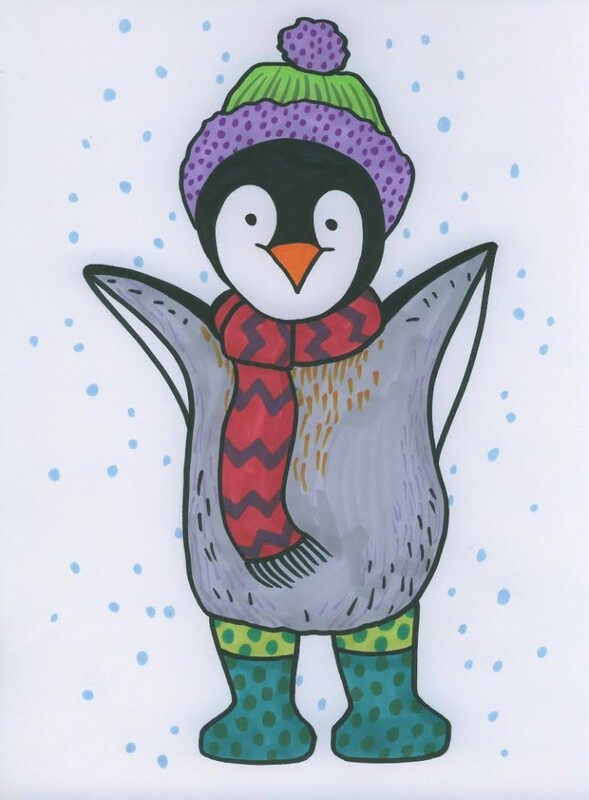 If you’re using markers, you don’t have to leave all your snow white – you can use pale, cool colors like light blue and light purple to make snowflakes around your penguin. When you’re done, if you want even more snowy fun you can glaze over your art with glitter glue – it’ll look like sparkling snowflakes!